a freely movable joint in which contiguous bony surfaces are covered by articular cartilage and connected by a fibrous connective tissue capsule lined with synovial membrane. 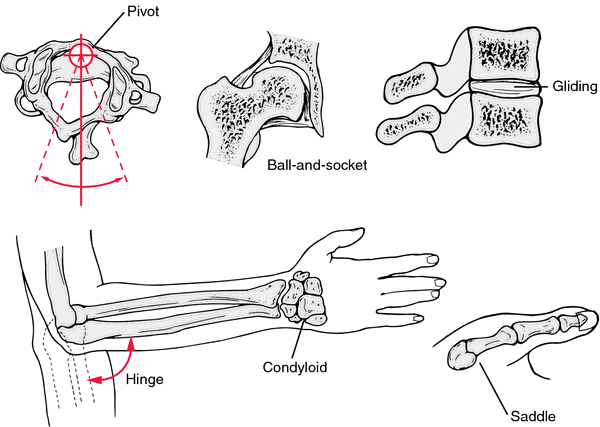 Kinds of synovial joints are ball and socket joint, condyloid joint, gliding joint, hinge joint, pivot joint, saddle joint, and uniaxial joint. Compare cartilaginous joint, fibrous joint. A particular type of joint that allows for movement in the articular bones. diarthrosis. See also articulation, temporomandibular. a protein-free dialysate of plasma with added hyaluronate, glycoproteins and other unidentified substances added by the synovial membrane. Called also synovia. pleats of synovial membrane infoldings into joint cavities. nonarticulating areas in synovial joint articular surfaces found in the larger joints of larger animals. They are recessed below the surface of the cartilage and are unevenly sculpted. a specialized form of articulation permitting more or less free movement, the union of the bony elements being surrounded by an articular capsule enclosing a cavity lined by synovial membrane. Called also diarthrosis. the inner of the two layers of the articular capsule of a synovial joint; composed of loose connective tissue and having a free smooth surface that lines the joint cavity; it secretes the synovia. 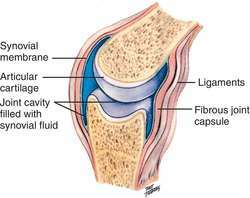 the lubricant in synovial joints; an acidoglycoprotein, the acid polysaccharide portion of which is hyaluronic acid.